"Aedie's House", Aberdeen City Council. "Ædie's Lodging", Lost Aberdeen, Diane Morgan, 2004. 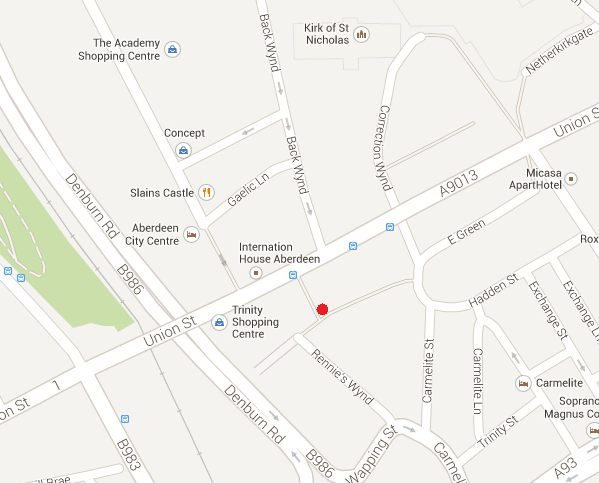 Sometime before 1604, Andrew Ædie built a townhouse on The Green, S of St.Nicholas' church, Aberdeen town centre. Aberdeen City Council says the house that stood for many years was this original house built by Andrew. It says: "One carved stone in a dormer window of the house bore the initials AE and CG standing for Andrew Aedie and Christian Guthrie"
[Munro, 1887] says the house in The Green that stood for many years was built in 1633 by Andrew's son David Ædie. [Munro, 1887] said the house bore the inscription "D. Æ. 1633". [Morgan, 2004] says David did not build a new house but made modifications in 1633 to his father's house. The house was called "Ædie's House" or "Ædie's Lodging". 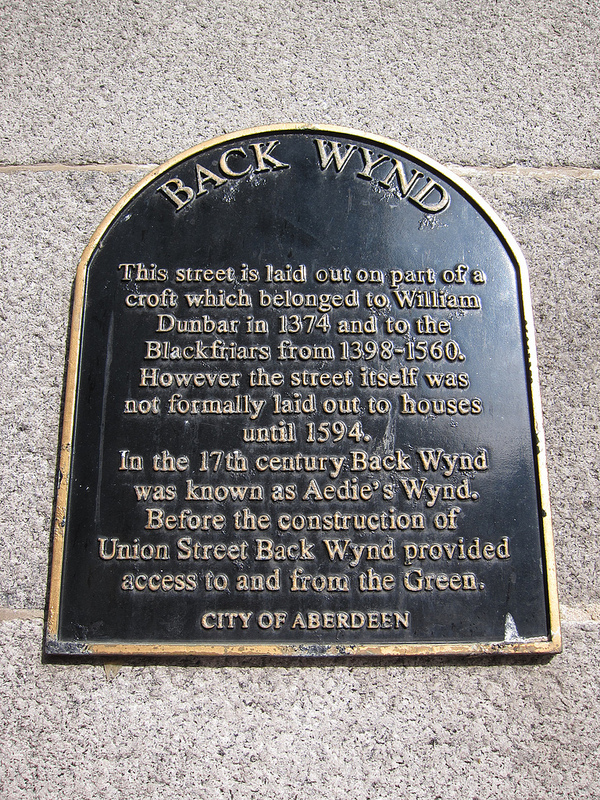 The street from the house up to St.Nicholas' church was called "Ædie's Wynd". A "wynd" is a lane. 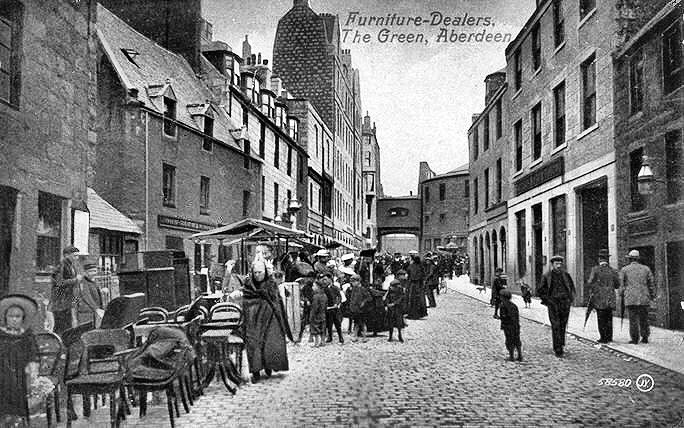 Later the N part of Ædie's Wynd became known as "Back Wynd". The house still stood at the time of [Munro, 1887]. It was demolished in 1914. The site is now an empty lot. Site of Ædie's House (empty lot to RHS of steps). The stairs go up to Union St.
A trace of the E wall of Ædie's House is still visible today - the roof outline and internal fireplaces. From The Miscellany of the Third Spalding Club, either Volume I (1935) or Volume II (1940). Ædie's House. Late 19th century photograph. Ædie's House visible here on LHS. Site of Ædie's House (red spot). 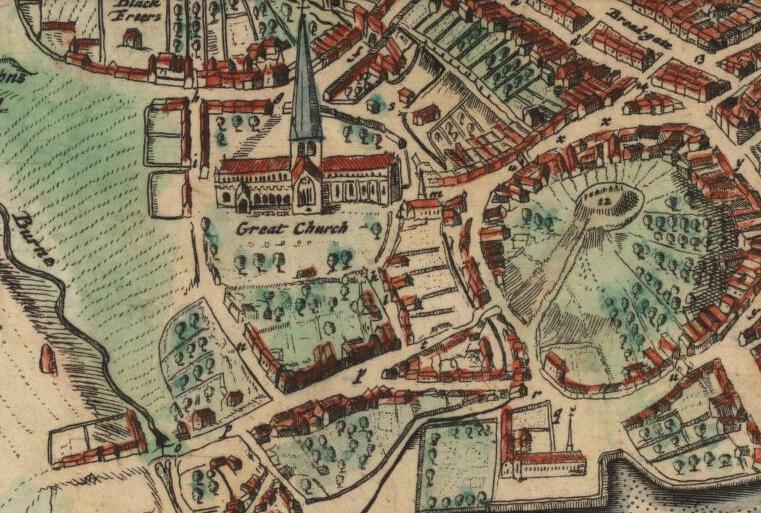 The laneway "Ædie's Wynd" ("n") on Aberdeen map of 1661. 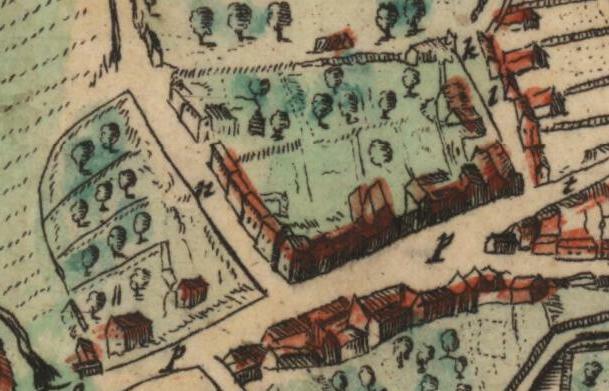 Close-up of Ædie's Wynd ("n") and The Green ("p") on 1661 map above. 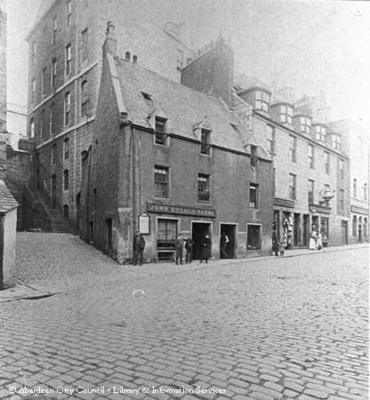 [Munro, 1887] says Ædie's House once formed the corner house of Ædie's Wynd, which would make it the corner house here. 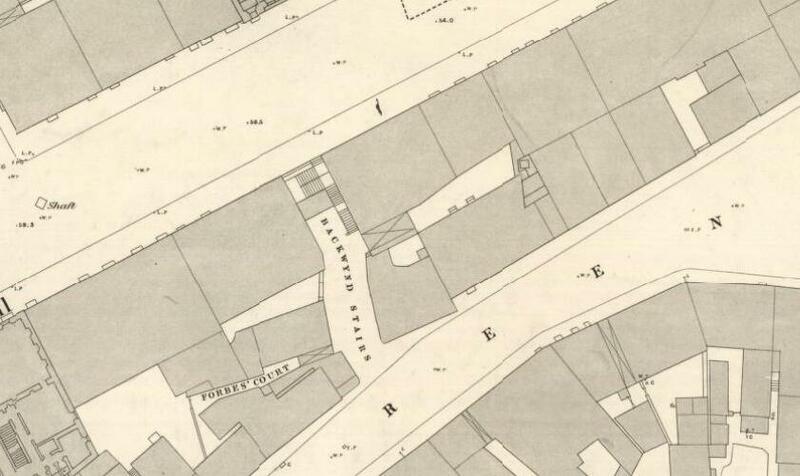 Ædie's House in this section of Aberdeen map of 1866-67. The house is at the foot of Back Wynd Stairs. Union St above, The Green below. Plaque at the S end of Back Wynd (see street view) noting that it used to be called Ædie's Wynd. Photo 2013. From here. Creative Commons.